My recent junkyard trips for automotive relays has me desiring a battery powered portable relay tester. It should be simple enough to build one instead of buy one, so here is my attempt to do so. The design goal here is to devise a relay tester circuit that uses a standard ISO Mini relay socket wired for a "Type B" configuration relay. So lets touch briefly on what I mean by "Type B" configuration. The image to the right shows the difference in pinout. Between Type A and Type B, terminals 86 (coil) and 30 (switch common) are swapped. 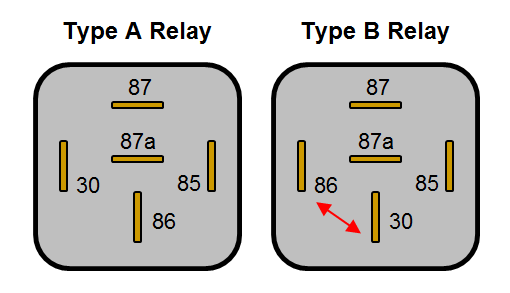 In my experience, Type B is far more common than Type A. I have only stumbled across Type A relays in some BMW models. I've found vastly more Type B relays from many common makes (Toyota, Volvo, Jaguar, Ford, and Dodge to name a few). Beyond being wired for Type B configuration relays, I want my tester to be setup so it can test Diode Coil Suppressed relays. Thankfully there is a standard here for this and the standard says that the Cathode of the diode will always be connected to terminal 86. 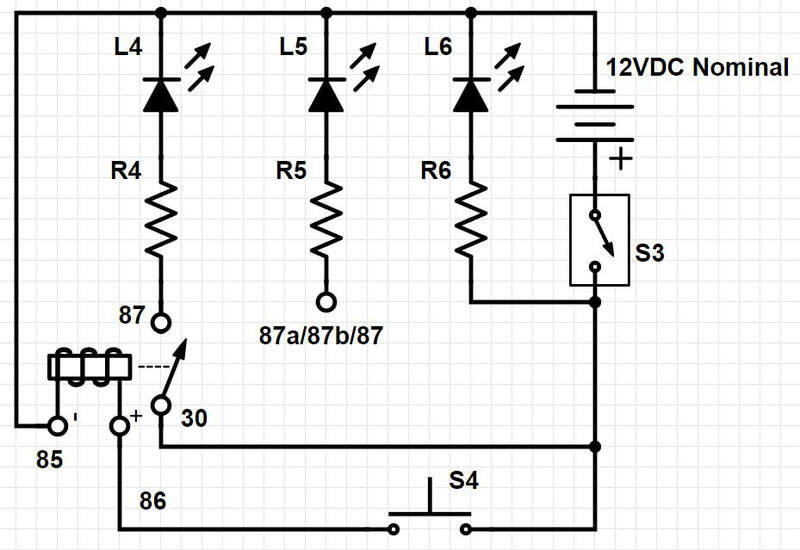 Therefore, my relay tester must have positive supply connected to terminal 86 of the coil and ground is on Terminal 85. After that I just need a couple switches and some LEDs for indication. So, I used Digi-Key SchemeIt to draw a wiring diagram. This is pretty simple but I will outline what is going on. My battery will be three 18650 Lithium Ion cells wired in series. This will produce up to 12.6 VDC (4.2V per cell) when they are fully charged and 11.1 VDC when depleted (3.7V per cell). 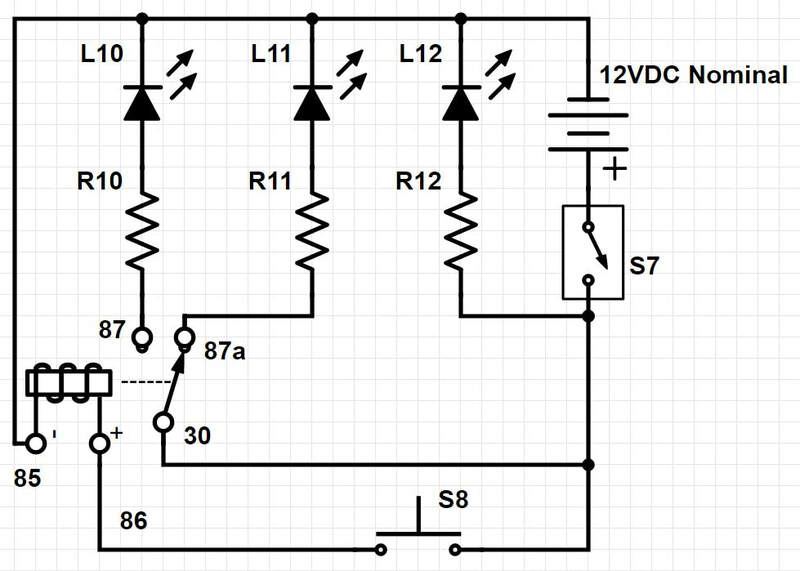 So, nominally I achieve 12 VDC. 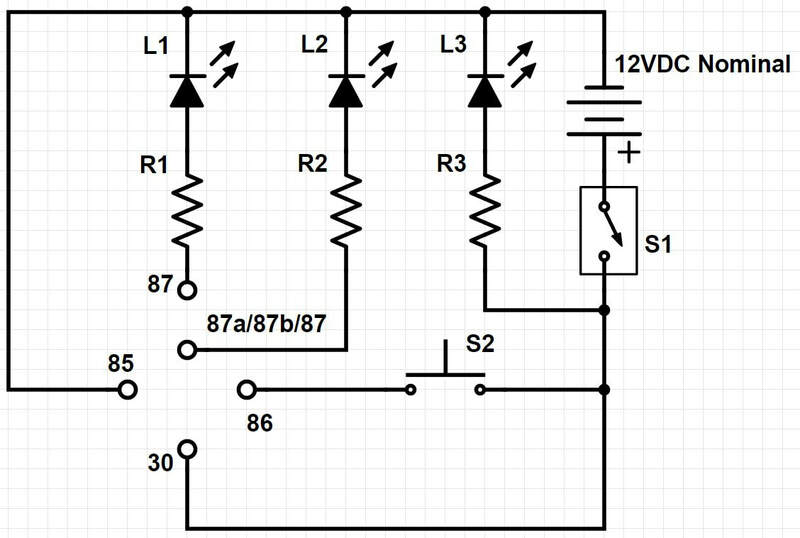 This is perfect for automotive relays rated to run at automotive 12V, which can really be as high as 14VDC. Switch S1 is just my device On/Off switch, nothing fancy. 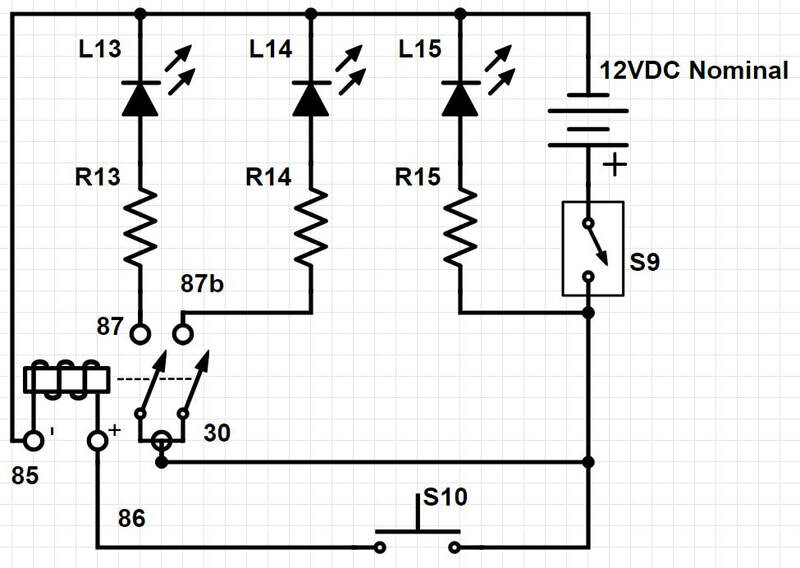 LED L3 is my main power ON indicator light with voltage dropping resister R3. Ok, now the good stuff. S2 is a momentary push-button style switch that supplies power to terminal 86. Terminal 85 is my ground. Pressing S2 completes the circuit and energizes the coil. Next is my battery power feed to terminal 30 or "switched common". Terminal 87 by standard is a Normally Open terminal, so when main power is ON, but S2 is not pressed (open), terminal 87 will not receive power. Pressing S2 switches the contacts and terminal 87 receives power. At this point, LED L1 lights up. R1 is the voltage dropping resistor for L1. Lastly we have terminal 87a/87b/87 and I'm denoting it like this on purpose. See, the beauty of this tester is I can test any configuration (or "form") of Type B relay. This includes SPST (Form A), SPDT (Form C), 2xSPST (Form U) and SPST Dual-87. If I am testing an SPST Form A, then this 87a/87b/87 terminal will do nothing, it will never receive power. If I am testing an SPDT Form C or "changeover" relay (87a terminal present), then when S2 is not pressed but main power is on, then LED L2 will light up (R2 is the voltage dropping resistor for L2). 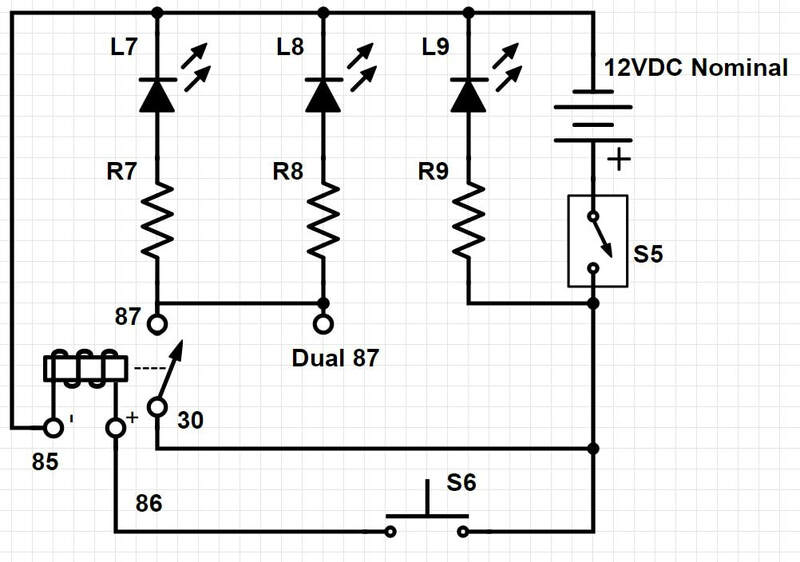 When S2 is pressed, then the relay changes over and L2 turns off and L1 turns on. If I am testing a 2xSPST Form U (87b terminal present), then with main power on but S2 not pressed, both L1 and L2 will be off. When S2 is pressed then both L1 and L2 will turn on. If I am testing an SPST Dual-87 then this will act just like a normal SPST Form A relay. I realized that with the addition of 1 more switch, a DPDT, I could create a tester that would test both Type A and Type B Relays. Here is the Version 2.0 schematic. The DPDT Switch labeled "Type A/B Selector" acts as a power supply changeover for terminals 30 and 86. Basically, because I want to retain the momentary push-button to energize the coil, I need a DPDT that will switch or "change over" the constant power supply for whichever terminal is terminal 30 (switch common) and do the same for the momentary power for terminal 86 (coil energizing). In the configuration shown by the schematic, this circuit will test a Type A configuration relay by supplying constant power to the 30/86 terminal and momentary push button power to the 86/30 terminal. 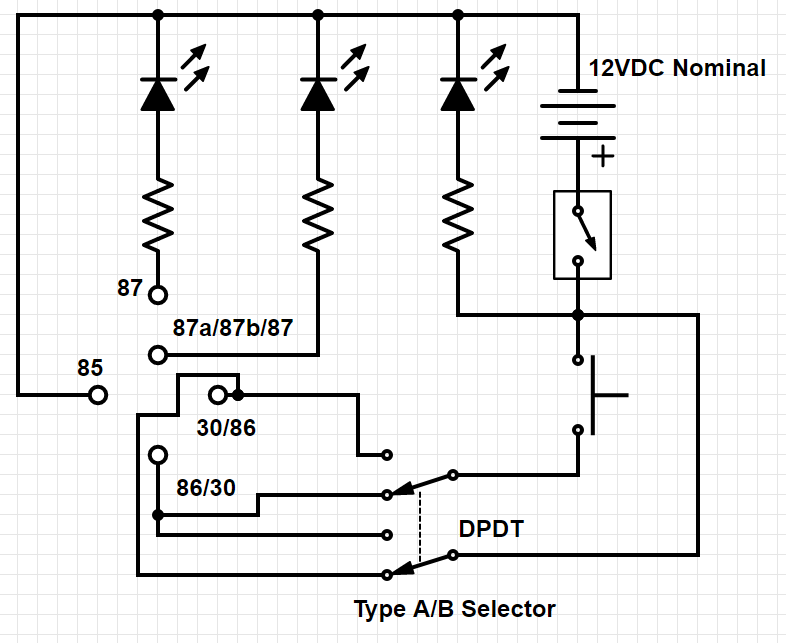 By switching the DPDT position the tester can now test Type B configuration relays. Constant power is supplied to the 86/30 terminal instead and push button power is now supplied to the 30/86 terminal. Adding 1 simple switch now allows the tester to be much more functional.